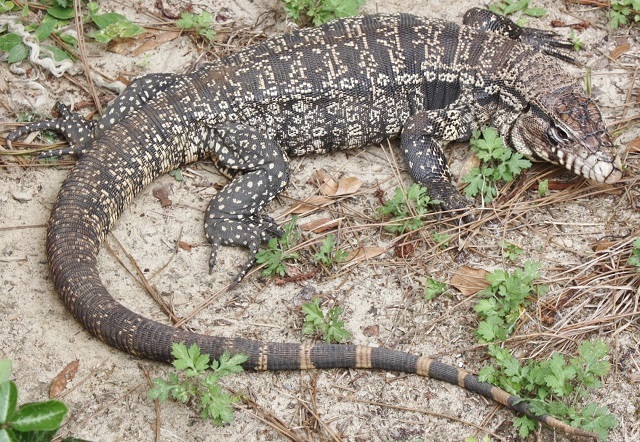 PALM BAY, Florida - An invasive species of giant lizard known as a tegu was repeatedly spotted this week in Palm Bay, Florida. The Argentine black and white tegu can grow up to four-feet long, has sharp teeth, strong jaws, and sharp claws. Tegus are black and white in color with banding along the tail. Tegus reproduce quickly and eat a wide variety of food items, including small animals such as domestic cats, and the eggs of many wildlife species. The tegu was spotted in a Palm Bay neighborhood located around Town Road Southwest and Topeka Road Southwest. According to the Florida Fish and Wildlife Commission's database, tegus have been spotted before in Brevard County. In 2015, two confirmed tegu sightings were recorded in north and south Melbourne, Florida. Although the giant lizards spend most of their time on land, they can swim and may submerge underwater for long periods of time. 3. Report the sighting to FWC. Reporting your sighting will help wildlife managers better understand where the animals are found. Sightings can be reported over the phone to FWC's exotic species reporting hotline at 1-888-Ive-Got1 (1-888-483-4681) or online at IveGot1.org. The FWC says that the best method for removing tegus is by trapping. If you see a tegu on your property you can contact a local wildlife trapper to remove the animal.